There are several suggested criteria to use to help differentiate these two ECG diagnoses including Wellen’s Criteria, the Griffith Approach and of course the Brugada Approach. Below is a summary of the pertinent points that I found helpful and have subsequently taken to the bedside. First things first… If the patient is the same colour as your underpants or if they tick the boxes for instability (hypotension, chest pain suggestive of ischaemia, dyspnoea or pulmonary oedema and altered mental state) then head to your defibrillator and shock !! The presence of Cannon A waves, variation in arterial pulse or a variable 1st heart sound strongly suggest VT. Examination is not helpful in ruling in SVT with aberrancy. SVT with aberrancy is possible in the setting of QRS complexes consistent with classic bundle-branch block patterns. AV-dissociation: presence of P-waves (at a different rate to the QRS complexes) & Capture beats (a normal P-QRS sequence). Extreme left axis deviation (or North-West axis). Presence of either ‘all R-waves’ or ‘all S-waves’ throughout all precordial leads. In RBBB pattern (V6): QS complex without an R-wave or R/S ratio <1 (small R-wave, deep S-wave). In LBBB pattern (V1): Initial R-wave > 30-40 msec or a notching or slurring in the S-wave or an RS interval (onset of R-wave to nadir of S-wave) of > 60-70 msec. In LBBB pattern (V6): QS waves or qR pattern (small Q-wave, large R-wave). Remember: if in doubt, or patient unstable then treat as VT !! So what happened for our mischievous duo…. ECG: Regular broad complex tachycardia. Rate 166bpm. QRS ~120 msec. No P-waves. Left axis deviation. No evidence of AV dissociation. No capture or fusion beats. 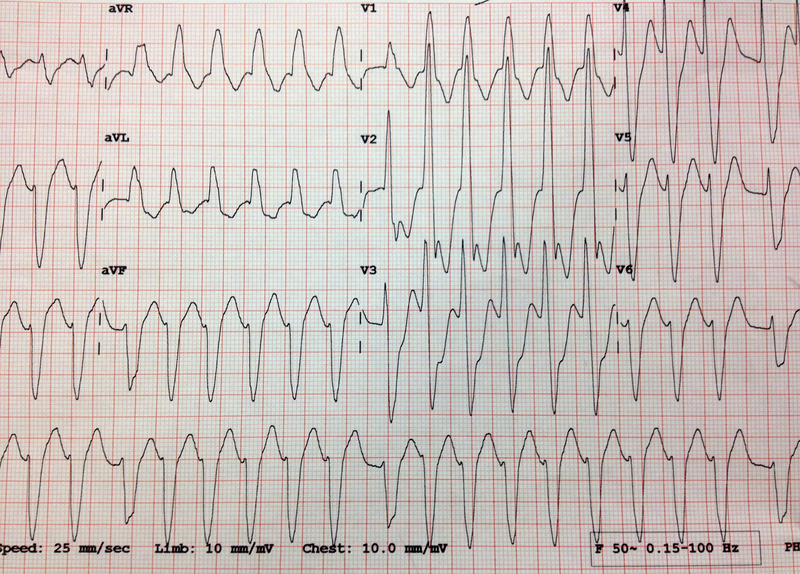 Typical LBBB pattern. Very likely to be SVT with aberrancy. Her old notes rapidly arrive & these QRS complexes are identical to previous sinus ECGs. She receives 6mg IV Adenosine & reverts to sinus rhythm. She is discharged shortly after. 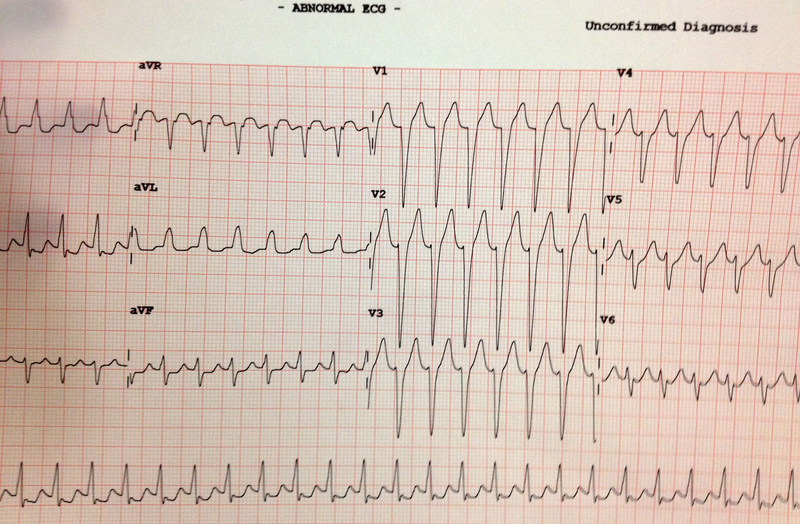 ECG: Regular broad complex tachycardia. Rate 150bpm. QRS ~160msec. Extreme (north-west) axis. ?Capture beat (3rd & 9th complex), suggesting AV dissociation. RBBB pattern in V1 with notching (left rabbit ear up) with very small R/S ratio in V6. This is VT. The patient declared himself for us by dropping his BP to 70 systolic. He receives a small dose of midazolam & receives a 200J synchronized shock. He reverts temporarily but eventually requires further cardioversion. Following 100mg of IV lignocaine he stays in sinus & is admitted to Coronary Care. 1) Chan TC, Brady WJ, Harrigan RA, Ornato JP, Rosen P. ECG in Emergency Medicine and Acute Care. Elsevier Mosby 2005. 2) Mattu A and Brady W. ECGs for the Emergency Physician 1.